We are not proud that the number one reason why we wanted to travel to Melaka (also Malacca or Malakka), the UNESCO listed city since 2008, and also one of the most visited destinations in Malaysia was not because of its architectural and historical heritage. Our intentions were shallow: namely to eat and experiment all flavors that the gourmet's paradise has to offer. But luckily, during our raids to locals restaurants and food stalls, we needed some time to digest and could easily combine both, sightseeing and dining. Malaysia was the first country we visited during our Southeast Asia trip after exploring New Zealand and Australia, and we couldn't wait to experience a new culture, taste the food, and last but not least, our wallets could finally breathe a sigh of relieve for a while. For us, traveling means freedom, getting to know other countries, their cultures, heritage, and the food is for sure an integral and enjoyable part of it. Melaka's rich history reflects not only in architecture but also on the food scene. Over the centuries, the originally unimportant fishing village grew and attracted conquerors and colonizers from China, India, Portugal, Netherland or Great Britain which provided a good foundation for a mixture of influences. Nowadays, the majority of inhabitants are Malays, followed by Chinese and Indians and this fact must have been projected into all aspects of life, food included. Apart from others, comparably tasteful gastronomies, the most valued cuisine you can taste in Melaka is the Peranakan, also known as Nyonya cuisine. Nyonya is the notion attracting many tourists every year from abroad, but it also has a high reputation among Malaysian weekenders, mainly from nearby, only 150 km distant capital city Kuala Lumpur. Nyonya cuisine came with Peranakan Chinese, who are descendants of early Chinese migrants who settled in Melaka mainly between the 15th and 17th century and started to intermarry with local Malays. These Straits-born Chinese also addressed themselves as Baba Nyonya - Baba is an expression for Straits Chinese men, Nyonya for foreign married women. The same way as newcomers mixed with residents, the cuisine developed from strictly Malay into Nyonyan, using a blend of Chinese ingredients and combining them with Malaysian and Indian spices and cooking techniques. Key ingredients in Nyonya cuisine are coconut milk, galangal, laksa leaf, tamarind juice, lemongrass, ginger, jicama, coming along with rice, fish, chicken or egg noodles. The signature meal is soup called Laksa, but when in Melaka, it would be a shame to stick with only this one. Restaurants in Melaka can please all budgets so you can one day choose from luxury ones, then wander around street food stalls claiming they cook Nyonya cuisine (it became popular so make sure the magic word is not in use only as a tourist trap) and end up in classic Malay or Indian eateries. We stayed in a centrally located nice and affordable hotel Nomaps and were able to walk everywhere on foot. The most distant place we had to walk was around 20 minutes from our accommodation, but it is easy to take a cab or incredibly cheap-looking rickshaw if walking is not your thing or you feel tired after all the tasting. Always try to find online or ask in advance what the opening hours are to avoid unpleasant surprises. We selected meals and restaurants we enjoyed the most in Melaka, Bon appetite! 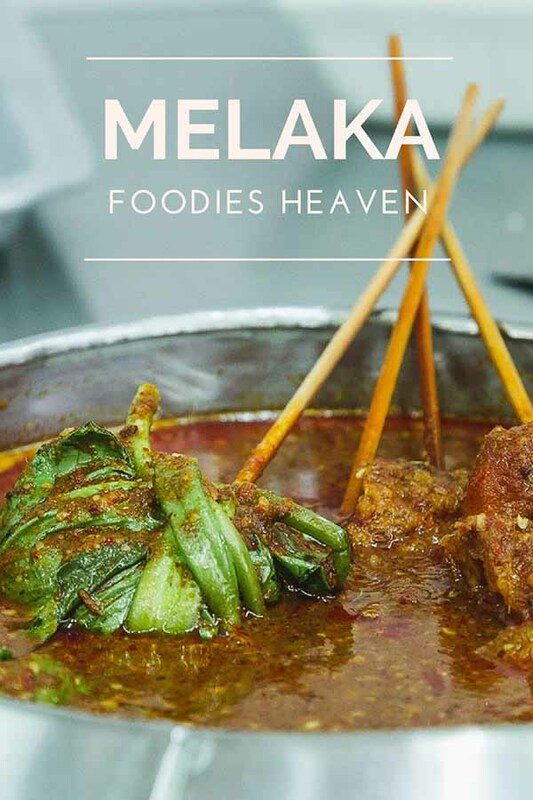 We've compiled the list of our favorite eating places in Melaka which you shouldn't miss. This dish is fun to eat. The most authentic version use bamboo skewers. Before you are seated you must first go and choose your meal from a large fridge, where are sliced and seasoned pieces of meat (chicken, goat, mutton, fish, shrimps), tofu or veggies stuck on the skewer. You'll take how many you want and go back to your table. In the middle of each table is a pot of boiling sauce (usually soy and peanut sauce) and you cook or warm up satay by yourself. When you finish, a server will count how many skewers are on the table, and you'll pay accordingly. This dish is cheap one usually cost less than 0.2 USD. You can also buy already prepared satay on the street. Delicious, moist chicken served with rice balls, chili sauce, and cucumber. It probably doesn't sound like a traditional breakfast dish, but we knew, that the restaurant with the best chicken in the city is well-known and there is always a queue of people lining up. We wanted to avoid the rush hour so when the place opened at 8:30 AM, sure we were there. And it paid off. The food doesn't look somehow spectacular on the plate, but the taste was excellent. Our Travel Tip: Come early in the morning otherwise prepare yourself to wait 30 minutes to 1 hour only to get in during lunchtime. Where: Kedai Chop Chung Wah,18, Jalan Hang Jebat. The marketplace, about 2.5 km from the city center is packed with locals enjoying the food and company of their friends, and even though it is a bit further from the center, this place deserves your attention. The food stall you are looking for is called Soon Yen. They serve delicious duck broth soup with noodles or its dry variation. The broth is well-balanced with a gentle touch of herbs and spices. We made two attempts to eat here, the first was unsuccessful, as we did not check opening hours - this place closes early around 1:30 PM or when sold out and they have a day off on Tuesdays as well. The second try was fruitful though. Where: Soon Yen Duck Noodle, Jalan Tengkera, Tengkera Kampung Sembilan. When looking for Noynyan sweets, the number one shop in Melaka is Baba Charlie. They produce well-known sweets and pastries in, for us, untraditional colorful design. It became popular among tourists but is equally respected by locals which means the quality is outstanding, especially when you are looking for kuih, a traditional bite-sized dessert. The shop lies out of sight in a sideway alley, but there is a billboard on the main street or locals will help you to find it. Where: 72, Jalan Tengkera Pantai 2, open 10 am - 4 pm except for Thursdays. Indian cuisine has its rightful spot on Malacca food scene. And we found a place, where they serve the best Tandoori in the city and probably in whole Malaysia. The restaurant is packed, but they can extend seating area to the streets when the weather is good, where we also luckily found a table for two. This place is slightly more expensive but is worth every penny. Apart from their signature tandoori chicken, we had curries and naans altogether with a mango lassi. When not looking for something in particular, Jonker street is a place full of food stalls and smells. Especially at nights, it is a lively street with an uncountable number of food and drink options. If not hungry, at least fruit shake is a must. STILL CURIOUS? DISCOVER MORE ABOUT MALAYSIA WITH US!